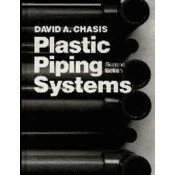 Provides a complete listing of the advantages of plastic piping systems. Discusses basic thermoplastic and thermostat manufacturing and flammability and toxicity of plastics. Supplies in-depth coverage on designing both above and below ground piping systems. Contains piping material sizes as well as dozens of photographs of various pipe, valves, fittings, and fabrications. Presents the historical background of the industry. Includes a comprehensive glossary, a listing of commonly used plastic and industry abbreviations, an expanded chemical resistance chart of over 600 chemicals, and many other helpful items. Material Selection. Piping Design Characteristics. Joining Methods of Plastic Pipes. Product Selection. Installation, Testing, Repairing Plastic Pipe. Cost Comparisons. Applications. Appendix. Index.